Legendaariset Cleto Reys tuotteet nyt myös meillä! Cleto Reyes Castro was born on April 26th 1920 in Mexico City, in the midst of the reconstruccion times after 10 year of revolutionary struggle. Because of the hard times his family was facing, Cleto had to start working at the age of 12 in a saddlery that manufactured baseball goods. In 1936, while he was going to elementary school in premises across the “Peralvillo Cozumel” ring, his love for boxing was born. In 1938, cleto reyes took part in an amateur fight and his performance was so outstanding that the public ended up throwing coins into the ring floor; however, the pounding was so hard that he was convinced not to fight again. He chose, instead, to mead the gloves he had used during the fight and this started his career in glove manufacture. subsequently his gloves obtained the approval of the local boxing commission (COMBOX DF), and in 1945 the Cleto Reyes gloves were used in a world championship fight for first time on “La Condesa Arena” was the setting of the fight between the second Mexican Champion, Juan Zurita, and Ike Williams. that year was very important, because Don Cleto decided to become independent, always counting on his wife and children´s valuable help. In 1965, he had his first commercial representative in Los Angeles who began distributing his products in the most important cities of the United States and some other countries. 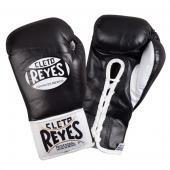 in 1970, during a time in which Don Cleto`s health was ailing, his son, Alberto Reyes joint his father´s efforts and with a firm entrepreneurial vision he decided to register the trademark Cleto Reyes in 1975 and to found Industria Reyes S.A. de C.V. in 1979.